A rare 1954 AJS E95 "Porcupine" motorcycle is being expected to become the world's most expensive motorcycle when it goes on sale at the Bonham's auction at the Pebble Beach Car Week this August. The motorcycle is one of the only four AJS E95 Porcupines built by British manufacturer AJS during World War II. The 1954 AJS E95 Porcupine, which has been with the National Motorcycle Museum in Coventry for last 20 years, got its name from its distinctive spiked fins on the sloping cylinders. The spellbinding two-wheeler of Yamaha is actually a ‘metric’ chopper that was designed and built by Sam Nehme, owner of Florida’s premium motorcycle custom and dealership store, Broward Motorsports and BMS Choppers.The 24-karat gold plated Yamaha Road Star mounts a 1,700cc V-twin engine, but it offers only a single seat that is covered with fine red velvet like a king’s throne. The length of the bike is 3.5 meters and it incorporates a single-sided “fork” on the front that was created after extensive testing and design work. The bike also includes an air-ride system. In addition, there is a single-sided swing-arm rear suspension in Nehmesis that enables the riders to lift the bike up to 25 centimetres from the ground or bring it down to the surface level. The Dodge Tomahawk was a non–street legal concept vehicle introduced by Dodge at the 2003 North American International Auto Show in Detroit, Michigan. Dodge's extraordinary claims of a top speed of 420 mph (680 km/h) were derided by experts in land speed records, and the Tomahawk never demonstrated a speed above 100 mph (160 km/h).The Art Deco design was the work of Chrysler staff designer Mark Walters and featured the 500 hp (370 kW) 8.3-litre (510 cu in) V10SRT10 engine from the Dodge Tomahawk .The vehicle has two front wheels and two rear wheels,( Four-wheel bike) making it a kind of motorised quadricycle rather than a typical motorcycle. The pairs of wheels move independently, allowing it to countersteer and lean in turns like a motorcycle. The MTT Turbine Superbike, also known as the Y2K Turbine Superbike, is a wheel-driven motorcycle powered by aturboshaft engine. When MTT president Ted Mclntyre decided to add a motorcycle to his firm's range, he appointed Christian Travert, a former bike racer and custom builder, to head the project. The machine is powered by a Rolls-Royce-Allison Model 250 gas turbine producing 320 shp (240 kW) at 52,000 rpm. Unlike some earlier jet-powered motorcycles, where a massive jet engine provided thrust to push the motorcycle, the turboshaft engine on this model drives the rear wheel via a two-speed gearbox and chain and sprocket. 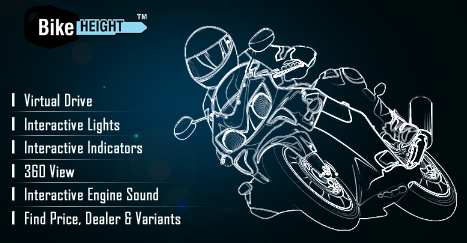 Lightning Motorcycle Corp. is an American manufacturer of electric motorcycles. CEO and Founder Richard Hatfield started the company in 2006 from San Carlos, California.The Lightning Electric Superbike set a new land speed record with an average of 173.388 mph at the BUB Motorcycle Speed Trials on the Bonneville Salt Flats. It later set a new record in 2012 with a 2 way average of 215.96 mph and a top speed of 218.96 mph in Bonneville. In 2012, the solar-powered Barracuda Lightning Bike won the joint eGrandPrix TTXGP and FIM ePower electric motorcycle racing series at the Mazda Raceway Laguna Seca with rider Michael Barnes Superbike was considered the fastest motorcycle in the world, working on an electric motor. According to the results of test check of the Great Salt Lake Desert Lightning Electric Superbike has a top speed 352 (km/h) per hour. Yamaha has revealed the official details on the 2011 YZF-R1, the only production motorcycle with a crossplane crankshaft. The 2011 YZF-R1 is powered by a 998cc, DOHC, 4-valve, in-line 4 engine developing 182 hp at 12500 rpm and 115.5 Nm (85 lb.ft.) of torque at 10,000 rpm, and delivering a fuel consumption of 40mpg (5.88 l/100km).The engine features forged aluminum pistons that take maximum advantage of the power characteristics. Titanium intake valves are lightweight. A forced-air intake system is adopted to increase intake efficiency by using the natural airflow during riding to pressurize the air in the air box. This contributes to outstanding power delivery characteristics in the high-speed range, while the design also helps to minimize intake noise. The new MV Agusta F4 R 2012 has been designed to offer clients a superbike with extreme performance. The key feature of the F4 R is, in fact, the new “Corsa Corta” engine capable of extraordinary performance and already employed on the F4 RR, the top of the MV Agusta superbike range.The new 4 cylinder inline with radial valves is the pulsing heart of the MV Agusta F4 R. The thermodynamics have been completely redesigned, starting from the new low inertia crankshaft which makes it possible to use a super over-square bore and stroke ratio. In this way, the MV F4 R is capable of reaching rpm worthy of a pure racing motorcycle. The engine capacity of 998cc has been obtained by using a bore of 79 mm and a stroke of only 50.9 mm. In this way it is possible to achieve an extremely high 13700 rpm rev limit while at the same time lowering the linear velocity of the piston from 24.9 m/s to 23 m/s improving reliability. Hyper-sports touring motorcycle. One of the latest BMWs and that means it’s a seriously sorted motorcycle. The BMW K1200S has Suzuki GSX-1300R Hayabusa rivalling power but comfort and practicality too. Some radical engineering and plenty of proven technology. The latest Japanese hyper motorcycles are edging again on power – but the BMW K1200S is never short of shove.The BMW K1200S capacity 167 horsepower provides to disperse hundreds of 2.8 seconds. In addition, the model has excellent handling on the road: low center of gravity can literally "go" in the turns, and electronic suspension adjustment and anti-lock system increases smoothness.